UPDATE: In the most recent PTR build, the Deadmines Pet Battle Dungeon pet rewards are now purchasable from the NPC that sends players into the scenario. They are no longer an achievement reward or bag drops. Learn more about this new Pet Battle Dungeon below! The mystery of the Shadowy Figure continues as we travel from Wailing Caverns to Deadmines in 7.2.5. Note that the following content is previewed from the PTR and as such is subject to change. Level 110 players that completed Wailing Critters will be offered a new quest from Breanni in Dalaran (Broken Isles). Despite adventurers clearing out Deadmines not just once, but twice, there are rumors of suspicious happenings going on inside. Breanni sends you to Westfall to meet up with an old friend, Marcus "Bagman" Brown, who requests you investigate the dungeon. Similar to the Wailing Caverns Pet Battle Dungeon, the Deadmines scenario has 7 stages. 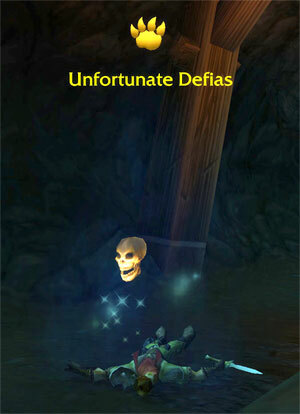 However, unlike its predecessor, Deadmines only has a total of 9 different enemy encounters. All primary enemy pets have either the Elite or Boss passive, and backline pets are common quality crabs, rats, and parrots. Stage 1: What Is All This Junk? Stage 3: Worst. Guard. Ever. Stage 4: Outta My Way. You Oaf! Stage 7: The Soup's Gone Bad! Completing the one-time, Normal Deadmines Pet Battle Dungeon quest rewards an Ultimate Battle-Training Stone plus the ability, Manapoof Link: Westfall. Speak with the NPC next to Breanni in Dalaran and it will provide a direct teleport to Deadmines. The Challenge version of the dungeon is also unlocked upon completion of Normal mode. It requires at least 15 level 25 pets, and pets cannot be healed or revived while inside the Challenge scenario. Pet Battle Challenge: Deadmines is a weekly, account-wide quest that rewards 1 Old Bottle Cap which can be exchanged with Marcus "Bagman" Brown for the new Deadmines-themed pets. Are you looking forward to the next Pet Battle Dungeon? Who do you think the Shadowy Figure is? We can't wait to unravel this mystery! I've listed the abilities for each pet on my blog. Is is there anyway you could post breeds/stats/abilities of the three new pets? I have only done the Wailing Caerns twice, once the unlock and once the challenge. I simply haven't had the time to do it more even though I keep thinking of it. I am glad that a second Pet dungeon is coming out. Hopefully it will not take me three or four attempts on the final fight to cocmplete it. I am just glad I have such a nice assortment of Level 25 pets. I have yet to get a pet from the reward bag also! idk why you have bad luck then cause I got the venomfang and 2 everliving spores so far.